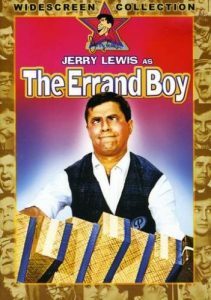 The Errand Boy is one of Jerry Lewis —  funniest movies, as well as being a biting satire of the movie industry. As with many of Jerry Lewis’ most funny movies, there is only a thin plot, allowing Jerry Lewis to hang slapstick comedy on the outline. In this movie, the movie mogul of — Paramutual Pictures —  is trying to find out why he’s losing so much money since his pictures are all hits. He decides to hire a lowly worker who will work throughout the studio and see and hear things, but too stupid to realize that he’s eavesdropping. He hires an inept worker putting up a billboard poster for the next Jerry Lewis movie —  Morty P. Tashman, played of course by Jerry Lewis. Jerry Lewis proceeds to spread chaos and comedy wherever he goes —  for instance, there is a very famous scene where he is working in the studio commissary, where some a young child wants a quarter’s worth of jellybeans, which are at the top of the shelf in a ridiculously large jar. So, Jerry goes up a long, rickety ladder on wheels, gets the jar, serves the customer, and puts the jar back. Only to have the next child want the same. Repeat the ladder, get the quarter, next customer: jellybeans! There’s also a very specific skewering of Hollywood all throughout the pictures, both at the pretentious movie stars and the moguls running the studio, especially with a scene in an empty conference room that has to be seen to be appreciated. In THE ERRAND BOY, Morty is hired by Paramutual Pictures as a spy to find out where the company’s money is being spent. Working in the mailroom, Morty has access to the production lot and discovers that wherever he goes, havoc ensues in his effort to provide his new boss, Mr. Sneak, with the information he has requested.